Anthony J. Goes, Vanessa Britting and Brian Murray in Simon Says. Photo by Maria Baranova. BOTTOM LINE: Theatre veteran Brian Murray returns to the stage in this thought-provoking but sometimes muddled drama. Loosely inspired by the lives of Edgar Cayce, one of the most well-known twentieth-century psychics, and Jane Roberts, a medium who channeled a being named Seth in the 1960s and 1970s, Mat Schaffer has crafted a contemplative discourse on science, the paranormal, reincarnation, and the connections between us. For a decade, Professor Williston (Brian Murray) has been engaged in studying the brain of James (Anthony J. Goes), a psychic Williston, or "Willie," has known since James was a child. When James was a boy he fell out of a tree and was hospitalized for weeks, unresponsive. After a nurse heard a voice coming from the comatose child telling her what to give him, James awoke after the “miracle” cure. James became a national phenomenon, and later a channeler of other lives as he’s taken over by an entity named Simon. There were tours and speaking engagements and now Willie talks of writing a book. Their relationship is loving but also suffocating for James. After putting off going to college, James and Willie have made an agreement for him to finally go. Now James has learned Willie stopped payment on the tuition check, fixated on continuing their work trying to prove that souls are real. James is ready to walk out for good until Annie (Vanessa Brittling) shows up for a scheduled session with Simon. She’s desperate and grieving for her dead husband. A science teacher and skeptic, she can’t help but see omens, such as this night, which would have been her husband’s birthday. When James learns that he and Annie both had grandmothers named Arlette who died of cancer, he agrees to stay. Over the course of the evening there is debate and philosophizing about the meaning of existence and consciousness, choice, free will, and love. Simon shares that he was an Essene, a member of the Jewish sect believed to have written the Dead Sea Scrolls. He takes them back to his time thousands of years ago when a deception led to a killing that links them in their present. It’s here that I think Schaffer needs to pump the breaks. There are many themes, some lofty, others convoluted, that he tries to explore. There are moments late in the play that feel both overstuffed and rushed, demonstrating that subjects such as past lives, existence, and souls are very hard to dramatize in a captivating way. That being said, the trio nimbly navigate through the somewhat murky waters. Murray, returning to the stage after a four-year absence, captures the passion and pathos of a man driven by selfishness and a quest to answer the unexplainable. Goes has the trickiest role, one in which the portrayal could have come off as hoaky or showy, but he finds the right tone without theatrics. Britting’s sincerity and vulnerability is palpable as she veers from sadness to anger and then understanding. Jamie Howland’s living room set looks appropriately cozy and lived-in, covered in piles of books, mail, and Persian rugs. John R. Malinowski’s lighting effectively conveys the moments when James jumps from himself to Simon and back, as well as when he channels other people. The play didn’t entirely gel for me, but it was nonetheless largely engaging, keeping my friend and me talking at length afterward. 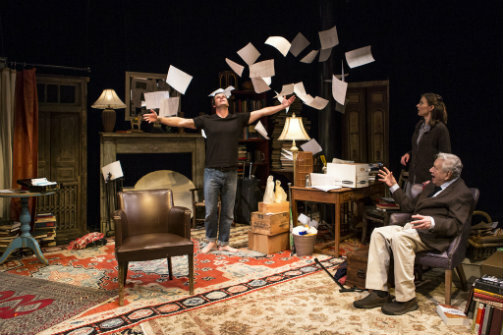 (Simon Says plays at the Lynn Redgrave Theater, 45 Bleecker Street, through July 30, 2016. The running time is approximately 90 minutes, no intermission. Performances are Wednesdays through Saturdays at 7:30. Tickets are $30-$65 and available by visiting cultureproject.org or by calling 212-352-3101. Simon Says is written by Mat Schaffer and directed by Myriam Cyr. Scenic Design is by Janie Howland. Lighting Design is by John R. Malinowski. Costume Design is by Cat Stramer. Sound Design is by Brian Doser. The cast is Brian Murray, Anthony J. Goes, and Vanessa Britting.